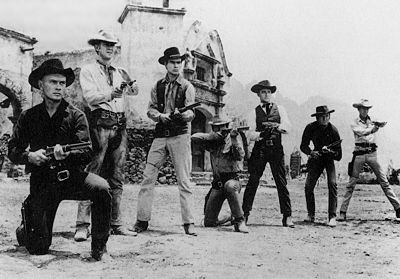 Publicity photo for The Magnificent Seven: (left to right) Yul Brynner, Steve McQueen, Horst Buchholz, Charles Bronson, Robert Vaughn, Brad Dexter, and James Coburn. The Magnificent Seven (1960) appears at a crossroads in the Western and reflects changes that were occurring in the genre--as well as likely influencing further developments. Besides being a Western, this film is a precursor of the vigilante film, where the corrupt and/or ineffectual law leads citizens to look elsewhere. Director John Sturges made The Magnificent Seven in between his two Earp-Holliday films, Gunfight at the OK Corral and Hour of the Gun, expanding his portrayal of an uneasy friendship to this brotherhood of misfits. Many of the misfits from The Magnificent Seven worked again with Sturges on The Great Escape, while Yul Brynner went on alone to The Return of the Magnificent Seven (1966). The Magnificent Seven belongs to an era when Hollywood strived to create bigger and bigger movies--to compete with television. This, of course, was the time of How the West Was Won and The Alamo, two huge Westerns, filmed in widescreen format with all-star casts. Brynner is the charismatic leader who recruits under-employed gunfighters for the low-paying, high-risk mission of saving an isolated Mexican village from a gang of bandits, led by Calvero, a scenery-chewing Eli Wallach. (Wallach built his early career on Hispanic roles, often as the villain, in films such as The Good, The Bad and The Ugly.) The film marked the early screen appearances of Steve McQueen and James Coburn, who were joined by Charles Bronson, Robert Vaughn, Brad Dexter, and Horst Buchholz. Elmer Bernstein’s score may actually play the largest role in the film, as the movie's theme and attitude is more important than dialogue--a style later exemplified by Sergio Leone. The Magnificent Seven marks the interesting intersection of the Western and directors Akira Kurosawa and Sergio Leone. Kurosawa cited John Ford as an influence on his work and the adaptation of Kurosawa’s Seven Samurai notes Hollywood’s appreciation of his work. Sturges also demonstrates with The Magnificent Seven the narrative possibilities with moving the Western below the Mexican border and presenting a multi-ethnic story. Not only did Leone pick up this challenge, he followed Sturges’ example and adapted Kurosawa’s Yojimbo as Fistful of Dollars--which was originally a short story by Dashiell Hammett that has most recently appeared as Walter Hill’s Last Man Standing. The Magnificent Seven differs significantly in tone and outlook from Leone’s films or the work of Sam Peckinpah. There is little that is cynical or fatalistic in this film. The Mexican villagers actively participate in their defense. They are neither as helpless or as corrupt as the citizens of later Westerns or the vigilante films of Bronson and Eastwood. In many ways, their characterizations are more complex and interesting than the Seven. This is a Western that insists on believing in heroism and its victory--and that heroism is available to all men, not just the "professionals." That is the magic of The Magnificent Seven. It manages to be a feel-good, hokey Western--during an increasingly cynical time. At the same time, it was well-made and complex enough to influence a score of filmmakers.